Born in 1969 in Oxford, England, Kelvin Scott began playing the violin as a young boy. Following university study in the United States, Kelvin Scott’s activities as a player led to an interest in the making of stringed instruments. He began his formal study of violinmaking at the Chicago School of Violin Making under the instruction of Tschu Ho Lee. Kelvin continued his training under the tutelage of master violinmaker Gregg Alf in Ann Arbor, Michigan where particular attention and energy was devoted to the making of close copies of classical seventeenth and eighteenth-century Cremonese instruments. 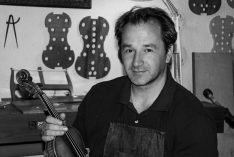 Since 1999, Kelvin Scott has applied himself exclusively to making new violins, violas, and cellos from his studio located in Knoxville, Tennessee. At present, Kelvin enjoys making copies of Italian masters while simultaneously devoting equal time to the production of his own models, which are grounded in tradition, but stamped with his own aesthetic as a craftsman. Kelvin has received numerous awards for his violins, violas, and cellos at international competitions, including three VSA gold medals, two for viola, one for cello, and two bronze medals at the Triennale Competition Cremona, Italy, one for violin, one for viola. Across all these competitions, all of his awards have recognized a high consistency for excellent tone. He has been granted the distinction of hors concours by the VSA, an award bestowed upon only a handful of makers worldwide. Kelvin currently lives in Knoxville, Tennessee with his wife Rachelle and their two children, Ian and Phoebe. Kelvin will be presenting a violin to this years exhibition.